Home of the Best Rum Reviews Online! Andy: I didn’t think it tasted as bad as I expected based on the smell. It is tasteless, with maybe the slightest hint of lemon, but relatively smooth. I think it is much better than Bacardi but it does leave a little after taste. Comparing side by side with Bacardi, the Bacardi is WAY harsher going down. I would take Happy Rum any day over Bacardi. Bacardi makes me want to hurl. 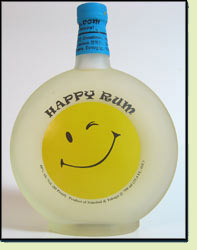 Adrian: This rum is clearly a marketing ploy based on also seeing Happy Gin, Happy Vodka and Happy Whiskey in the store. It is very harsh, not so good. The name and bottle is a cute idea, as long you don’t have to drink any of it. Contact mailus@rumreviews.com. Content and design © 2019 RumReviews.com. All Rights Reserved. Reproduction in whole or in part in any form without the expressed written consent of RumReviews.com is prohibited.